"Je ne regrette rien," the great French chanteuse Edith Piaf famously sang. "I regret nothing!" I only wish I could say the same, because in my five-plus decades on this spinning blue ball, I do have at least one major regret: that I didn't got to Egypt to see the Grateful Dead in 1978. Oh, it wasn't for lack of trying, either. I was well-established as managing editor of BAM, a popular free California music magazine, and I had a really good relationship with publicists at the Dead's record label at the time, Arista Records. This was an era when record companies were very free with their money--I was always being flown down to L.A. from the Bay Area to do interviews, and being put up at the Continental "Riot" (Hyatt) House on Sunset Blvd, and wined and dined. I was once offered a junket to New Orleans (which I declined because I hated the band I would have had to cover), so I figured there was no harm in asking Arista to fly me to Egypt with the guarantee that I would write a cover story about the Dead's trip for BAM. The initial signs from Arista looked promising, too. But in the end, they declined to pick up the tab. Now, this is where the Dead Head spirit in me should have kicked in. I should've figured out a way to get there on my own. But I was poor, and not willing to do "whatever it takes" to make the trip. Stupid, stupid, stupid. And so, those three nights in September, while the Dead were rockin' with the Sphinx, I was home in Berkeley brooding about my misfortune, trying unsuccessfully to teleport myself to Gizah. 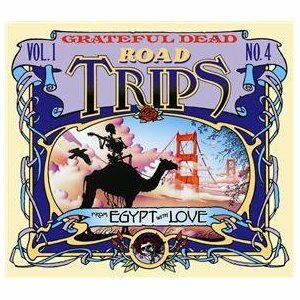 So imagine my delight when, shortly after the band returned to the Bay Area, it was announced that the Dead would play a series of five shows at Winterland dubbed "From Egypt With Love." I hadn't seen the group since their previous Winterland run at the end of December '77, so I was psyched, to say the least. Then, about a week before the shows, an incredible opportunity fell into my lap. We had decided at BAM that we wanted to do a cover story on the Egypt trip anyway, and asked if we could interview a band member about it. Much to our surprise they came back with the idea that Mickey Hart himself would write our cover story for us--about his experiences at the shows and traveling the Nile in the days afterwards. Now, at that point, Mickey wasn't really a writer (he would become a best-selling author years later) so he enlisted his friend Cookie Eisenberg to do an "as told to" story using his words. To help her out, I was asked to be a the go-between/editor for the story and get it all down on paper. This would be the first time I'd spend any extended time with a member of the band (I'd been at a Garcia photo shoot for a BAM cover a year earlier, but didn't interact with him much), so it was really exciting to suddenly find myself in Mickey's funky barn studio in Novato (Marin County) on a rainy October night, literally working by the light of multiple candles that were spread around the cavernous room, hashing out the story sentence by sentence. Hearing Mickey spin his tales of Egypt in that magical setting almost made me forget my disappointment about not going. We looked at dozens of color and black and white photos of the trip that had been taken by Mickey's friend Jerilyn Brandelius and other Dead Family members, and Mickey played us tapes he's made of Egyptian musicians in the days following the final Dead show there. I was in heaven. I was still floating from the high of that experience when I hopped over to Winterland for three of the "From Egypt With Love" shows--opening night on October 17, and then the two final nights, October 21 and 22. The mood in the cavernous but still cozy arena was so "up"--we greeted the band as if they were intrepid explorers who had just returned from some death-defying journey (which wasn't too far from the truth)! I remember there were some fans who got decked out in pharaoh-wear for the occasion--robes, sceptres, even a pyramid-shaped hat or two. Here and there you'd run across someone regaling a small group with tales of the Egypt trip; lucky bastards! Ah, but the band, bless 'em, had a treat in store for those of us who didn't make the journey: On a giant screen at the back of the stage, they projected dozens of cool slides (some of which had been among the ones Mickey had shown to Cookie and me). A shot of a maniacally grinning Garcia was greeted with a loud cheer; ditto ones of band and crew and Family sucking "hubbly-bubbly" out of big 'ol water pipes on a sailboat gliding down the Nile. The music at all five shows was superb, too. Since the band had returned from Egypt, they'd spent nearly every day at their Club Front recording studio working to finish their Shakedown Street album, so they were definitely primed and loose. The songs that would appear on that album all seemed to have a little more juice to them at these shows, as you can hear on the version of "Stagger Lee," "I Need A Miracle," and "Fire on the Mountain." At the shows represented here--the final two nights, October 21 and 22--there were also special guests who brought their own magic to the proceedings. Hamza El Din--a Nubian musician living in the Bay Area, who had joined the Dead onstage in Egypt with a number of other Egyptian singers and percussionists--reprised his role at Winterland, leading the Dead through a song called "Ollin Arageed," the crowd becoming part of the hypnotic tune with their rhythmic clapping. The version here is wonderful, as good as any of the ones in Egypt. The post-"Drums" segments on both the 21st and 22nd also visited some unusual space: On the 21st, Lee Oskar, the bushy-haired harmonica wizard from the band War, sat in for a meaty improv that eventually landed on a smokin' version of the old Muddy Waters tune "Got My Mojo Working" (nicely sung by Bob Weir); and the next night, ex-Quicksilver guitarist John Cipollina dropped by to add some of his patented whammy-bar cries to "Not Fade Away" and the circuitous jam that followed. Among the other treasures on this collection are a charged version of "The Other One," a long and mysterious passage through "Scarlet-Fire," a sweet, sweet "Peggy-O," and perhaps my all-time favorite version of "Stella Blue" (which is cut on the master sound-board recording, and is "completed" here with an audience recording... and is still killer!). The BAM magazine with Mickey and Cookie's cover story came out about ten days after the final show. On the cover was an illustration of a giant skeleton astride one of the pyramids. Inside, we ran photos from Mickey's travels around Egypt, as well as a beautiful and striking image Alton Kelley had created to commemorate the adventure. It was the first major story on the Dead in Egypt published in an American magazine. And even though my name doesn't appear anywhere on the article, it remains one of my favorite experiences in journalism. We didn't know it at the time, but "From Egypt With Love" would be the Dead's final multi-show run at Winterland. Shortly after these concerts, it was announced that the long-rumored closing of Winterland--to build condos!--was imminent. Indeed, December 1978 turned into a great month-long celebration of the storied venue, with all sorts of fantastic musicians playing there--from Tom Petty to Bruce Springsteen--culminating in the Dead's legendary Closing of Winterland concert on New Year's Eve. I still miss the funky old place, but it lives again through discs like these! Suddenly, 30 years feels like yesterday. With special guests LEE OSKAR, Harmonia on "Got My Mojo Working," "The Other One," "Stella Blue," and "Sugar Magnolia," HAMZA EL DIN, Oud and Vocals on "Ollin Arageed" and JOHN CIPOLLINA, Guitar on "Not Fade Away" and "Goin' Down the Road Feelin' Bad"
This album was released in September 2009.